Chicago is one of the most diverse cities in the country. It is also the most segregated. What usually wasn’t said — on a campus that brags about the diversity of its urban setting but where only about 5 percent of students are black — was that the neighborhoods beyond these boundaries were overwhelmingly black and poor. The U. of C. has, for many decades, treated Hyde Park as its “fortress on the South Side,” and its legacy of trying to keep its students within the neighborhood — and the black residents of surrounding communities out — has left its mark on Chicago. On Dustin Cable’s interactive “Dot Map” of racial residency patterns, Hyde Park appears as an island of blue and red dots — meaning, mostly white and Asian students and residents — in contrast to Chicago’s almost uniformly black South Side, designated in green dots. 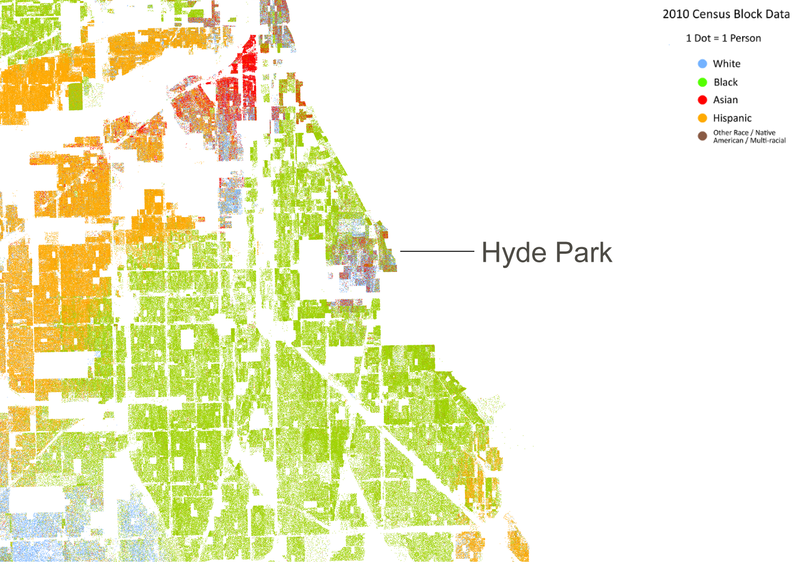 Washington Park, the neighborhood just to Hyde Park’s west, is 97 percent black3. Woodlawn — the neighborhood on the other side of 60th Street — is 87 percent black. You can see that by zooming out on Cable’s map and taking the 30,000-foot view of Chicago. Things start to look a little different: You notice the city’s diversity as much as its segregation. Citywide, Chicago’s population is almost evenly divided between non-Hispanic blacks (33 percent of its population), non-Hispanic whites (32 percent) and Hispanics (29 percent). So at a macro level, Chicago is quite diverse. At a neighborhood level, it isn’t. In Lincoln, this supposed integration looks awfully blue — which is to say, awfully white, since blue is Cable’s color for caucasians, who make up 83 percent of Lincoln’s population. 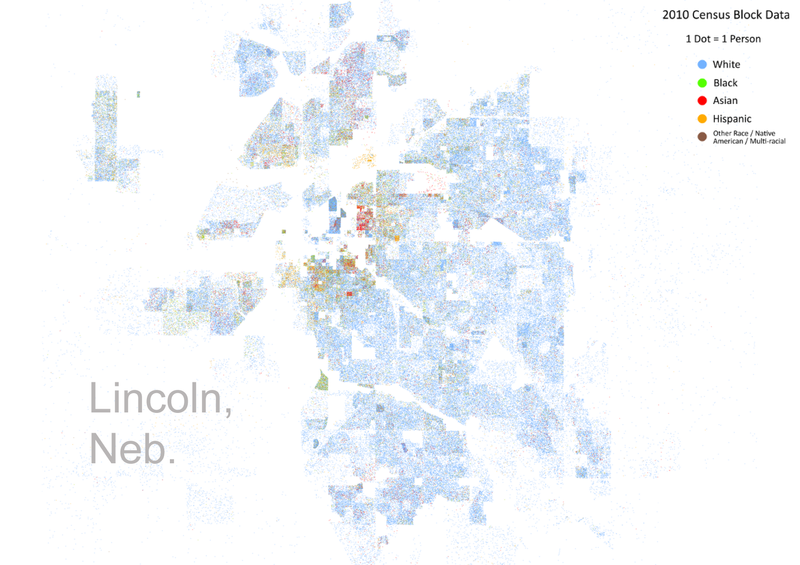 True, Lincoln’s few nonwhite residents are fairly evenly distributed throughout the city. But while Lincoln may be integrated, it’s not very diverse. So let’s aim to develop a slightly richer vocabulary. I’m going to describe three statistical measures of segregation and diversity. Like any statistical definitions, they are precise but limited in scope. They refer to racial diversity only and not economic diversity or diversity within racial groups. They pertain to where people live, and not where they work or go to school. In other words: They’re a starting point and not an end point. No one of them is inherently more valid than the others; it’s best if you look at them holistically. In this article, we’ll look at cities proper rather than metropolitan areas. Venturing beyond the city limits and into the surrounding area can sometimes lead you to different conclusions about a city’s demographic makeup, so we’ll look at those in a follow-up post. But cities themselves matter too, especially for questions of urban planning and city-administered services like schooling and policing. In order to provoke a few questions, I’m going to list the top 10 and bottom 10 U.S. cities by each of these measures (out of the 100 most populous cities). Chicago, for example, ranks near the top of the charts by one metric, but is at the very bottom on another. The lowest possible citywide diversity index is 0 percent, which is what you get if everyone is the same race. The highest possible one is 80 percent. Why not 100 percent? Because the Brown data only includes five racial groups. Even if the population is divided exactly evenly between these groups, you’ll still have 20 percent of the people belong to the same race as you. A few cities actually get pretty close to this ideal of complete diversity. Oakland, California, is not far from being evenly divided between whites, blacks, Hispanics and Asians; its citywide diversity index is 75 percent. New York’s is 73 percent. And Chicago’s is 70 percent. At the low end of the scale are extremely white cities like Lincoln and Scottsdale, Arizona. There’s also extremely black cities like Detroit, and extremely Hispanic cities like Laredo, Texas. Laredo, which is almost entirely Hispanic, has a citywide diversity index of just 8 percent. There’s something else important here. The term “diverse” is sometimes used colloquially as a euphemism for “nonwhite.” But our statistics don’t handle whites differently than the other racial groups. One advantage of this approach is that it can account for the degree of segregation between different nonwhite groups. While blacks and Hispanics are highly segregated from one another in Chicago, for example, they’re reasonably well integrated in Phoenix. 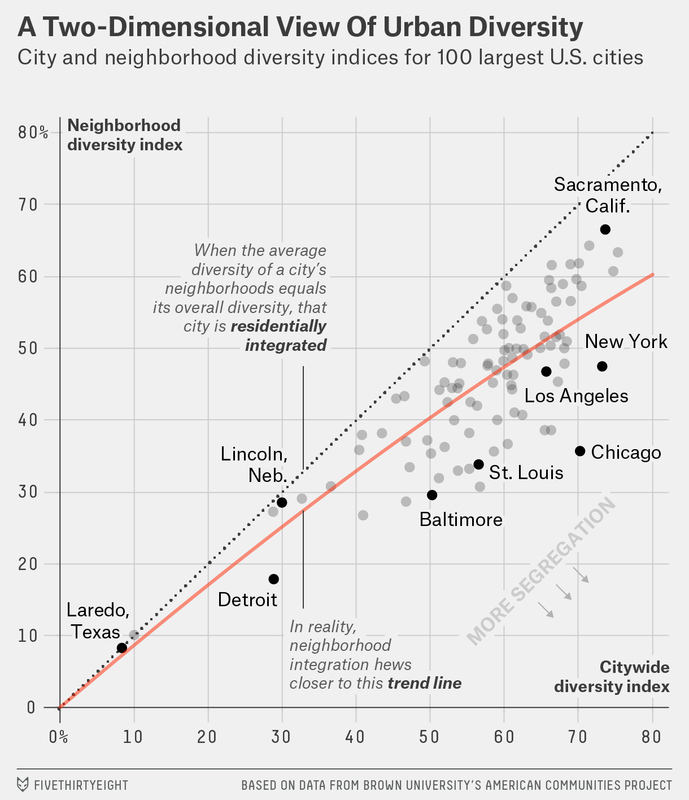 The neighborhood diversity index is always equal to or lower than the citywide diversity index. In other words, if a city doesn’t have much diversity overall, it can’t have racially diverse neighborhoods. But the reverse can be true, and often is: You can have a diverse city, but not diverse neighborhoods. Whereas Chicago’s citywide diversity index is 70 percent, seventh best out of the 100 most populous U.S. cities, its neighborhood diversity index is just 36 percent, which ranks 82nd. New York also has a big gap. Its citywide diversity index is 73 percent, fourth highest in the country, but its neighborhood diversity index is 47 percent, which ranks 49th. To be clear, New York and Chicago are still more diverse than cities like Lincoln, even at the neighborhood level. But as the numbers show, they are segregated because they underachieve their potential to have racially diverse neighborhoods. This chart is key to understanding our approach, so let’s take a quick tour, starting in the top-right corner of the chart and moving counterclockwise. The top-right quadrant contains cities like Sacramento, California, that have high neighborhood and citywide diversity scores. They’re both diverse and integrated. The top-left quadrant is empty. In theory, you’d place cities here if they had high neighborhood diversity but poor citywide diversity. But as we’ve said, you can’t have diverse neighborhoods if there’s no diversity in the overall population. In the bottom-left quadrant are cities like Laredo and Lincoln that score poorly on both neighborhood and citywide diversity. Because they’re so racially uniform, you can’t really define them as being either segregated or integrated. The bottom-right quadrant contains highly segregated cities like Chicago, Baltimore and St. Louis. They have average-to-good citywide diversity, but poor neighborhood diversity. The largest group of cities, including those like Los Angeles, are clustered just above these in the middle-right portion of the chart. They’re near the red regression line8 that indicates the typical relationship between citywide diversity and neighborhood diversity. These cities are reasonably diverse, but a very long way from being perfectly integrated. However, they’re not quite as segregated as cities like Chicago. The integration-segregation index is determined by how far above or below a city is from the regression line. Cities below the line are especially segregated. 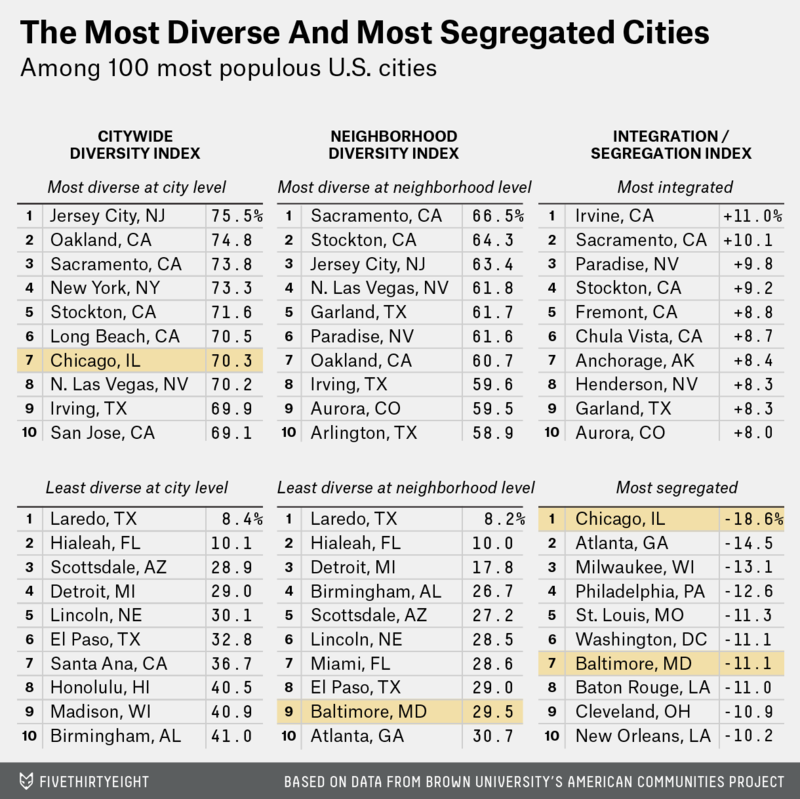 Chicago, which has a -19 score, is the most segregated city in the country. It’s followed by Atlanta, Milwaukee, Philadelphia, St. Louis, Washington and Baltimore. Cities above the red line have positive scores, which mean they’re comparatively well-integrated. Sacramento’s score is a +10, for instance. But here’s the awful thing about that red line. It grades cities on a curve. It does so because there aren’t a lot of American cities that meet the ideal of being both diverse and integrated. There are more Baltimores than Sacramentos. So while Chicago really is something of an extraordinary case, Baltimore isn’t an outlier, exactly. Most cities east of the Rocky Mountains with substantial black populations are quite segregated. There’s not a lot to distinguish Baltimore from Cleveland, Memphis, Milwaukee, New Orleans, Philadelphia or St. Louis. Do not go east of Lake Shore Drive — it was sometimes added drolly — unless you like to swim. Hyde Park is bounded on the east by Lake Michigan. The University Police is committed to preserving your safety, and within the bounds of the Hyde Park-South Kenwood neighborhood (the area bounded by 47th Street, 61st Street, Cottage Grove Avenue, and Lake Shore Drive) you are doubly protected by University and Chicago Police. The quickest way to calculate the citywide diversity index is to square each racial group’s share of the population, sum the result, then subtract the answer from 1. For instance, in a city that’s 70 percent white and 30 percent black, the citywide diversity index would be 1 – (.7^2 + .3^2), which is 42 percent. Formally, the neighborhood diversity index is calculated as 1 minus the isolation index for each racial group, weighted by that racial group’s share of the population in each city. Four thousand people take up more space in some places than others. My census tract in Manhattan is just four blocks long and two avenues wide. In Alaska or Wyoming, a tract might take up hundreds of square miles. Technically, it’s a regression curve rather than a regression line. It was formulated by a generalized linear model that mimics a probit regression, where the dependent variable is the ratio between a city’s neighborhood diversity index and its citywide diversity index. Oakland, California; Durham and Raleigh, North Carolina; Chesapeake, Virginia; Rochester, New York; and Jacksonville, Florida.